You are at:Home»Bizarre Tourist Attractions»Bungee Jumping… Into a Volcano? Bungee Jumping… Into a Volcano? When it comes to extreme things that you can do as a tourist, many people settle for a high-speed roller coaster or maybe visiting a haunted hotel. For those who are seeking out a thrill while taking a vacation or holiday, base jumping, bungee jumping from a bridge, and of course skydiving can all be added to that list. If you’re even tired of these adrenaline-pumping events, however, there’s something else you can try: bungee jumping into a volcano. You read that right! In Pucón, Chile, one organization is offering you the chance of a lifetime! You and someone you love can leap from a helicopter that has flown right into the caldera of a volcano, coming within 700 feet of molten lava. Could you die? Sure… but you’ll be signing a waiver, so it’ll be ok.
Villarrica Has An Active Lava Lake! Villarrica, which is also known to some as Rucapillán, is one of only 5 known volcanoes in the world that has an active lava lake within its crater. It’s also one of the most climbed stratovolcanoes in the world, allowing those who don’t really want to bungee jump into it the chance to explore the active cones that dot its surface. It is one of the most active volcanoes in Chile, if not the world, and has registered nearly 70 eruptions since records starting being kept. If you don’t feel like climbing the mountain and you don’t really feel like leaping into it, you can also pay a helicopter to take you up into the caldera so you can just take a look. The price tag for that helicopter ride? $1,995. Let’s face it – it’s not every day that you get to jump into an active volcano! If you’ve decided to take the plunge, then you’re going to get to experience a jump with a bungee cord that is about 350 feet in length. Since you can’t really undo a bungee jump after it occurs, you’ll then fly by helicopter back to the airport… while suspended 350 feet below the helicopter. If you don’t like bugs in your teeth, you might want to bring a toothpick! The company that provides this once-in-a-lifetime experience sells it in a comprehensive travel package. It’s a 6 Day/5 Night trip to the Pucón area that includes a day of whitewater rafting, a day of visiting the local hot springs, meals, drinks, and of course a commemorative t-shirt! All of this can be yours for just $12,500. You’ll be staying at the beautiful Hotel Del Lago Resort and Casino, where you can enjoy heated pools, hiking, biking, and plenty of gambling opportunities if you so choose! Other traditional holiday activities, such as golfing skiing, and fishing are also available. You’re also given free time to explore the area to take in local restaurants if you so choose, or you can take advantage of the provided meals if you’re looking to save a few bucks. 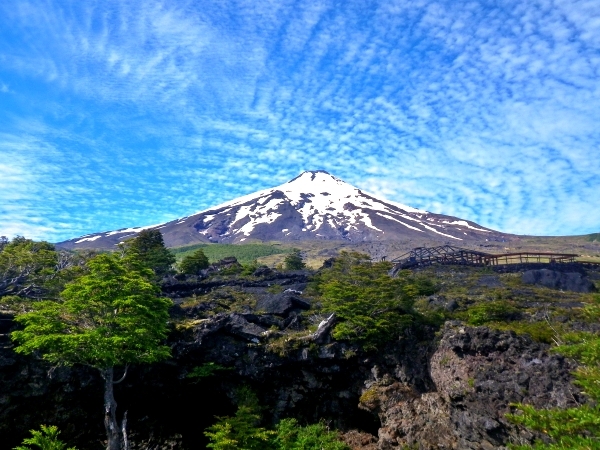 Whether you climb it, fly over it, or jump into it, Villarrica is calling out for visitors. Will you respond to its smoke signals?